Nita and Jamin’s destination wedding at The Waldorf Astoria Orlando was our very first in over ten years that had a pack full of puppies as part of the bridal party. No joke! 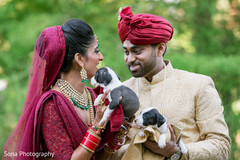 Nita is a wonderful veterinarian based out of Atlanta and had one “small” request to make her wedding extra special- she wanted to be snuggled by puppies before the wedding. Follow the link above to read more about their wedding plans and to see highlights from their events.